Air101: American Airlines Airbus lands with an additional set of wings. American Airlines Airbus lands with an additional set of wings. 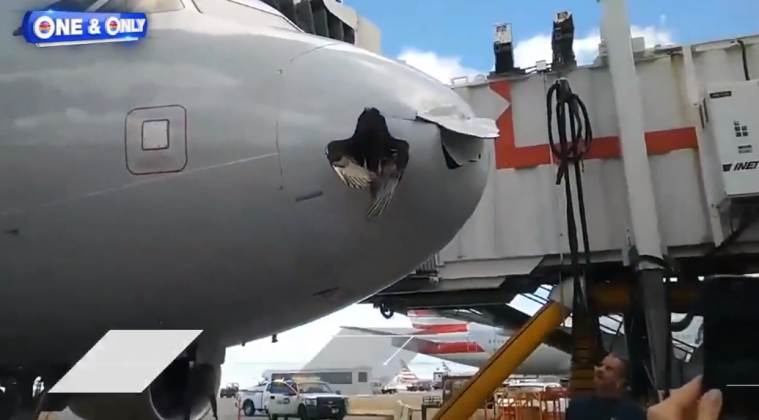 An American Airlines flight inbound for South Florida suffered a bird strike as it came into land at Miami International Airport yesterday. The aircraft operating flight AA1498 was in the latter stages of its approach to runway 09 at Miami when the incident occurred. The crew of the Airbus A319 were able to land safely after the contact with the bird despite it causing substantial damage to the nose of the aircraft. The aircraft taxied to the gate as normal and passengers disembarked the flight while engineers looked into the damage and saw that the bird was still stuck inside the broken nose cone of the aircraft.